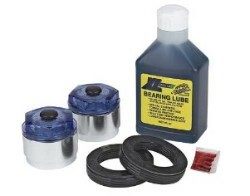 GREAT PRODUCT Better used with the smaller nut type spindle. I used this with the larger nut type spindle and had to use an improvised smaller cut down washer with the aluminum adapter so that it would have enough clearance and space in-between the outside of the washer and the I.D. of the aluminum adaptor, mine actually rubbed. Once I did that I had good results. Used it 2 summers with no problems in salt water on my stainless boat trailer !